Filmed 13 weeks out from the 2006 Mr Olympia. *** Ronnie’s bodyweight was an awesome 325 lbs. You will see Ronnie’s whole-body workout filmed over 4 days, including all 6 meals he consumes in the off season starting 10:30 am to 3 am. Next the video moves to September 11th, 2006 just 3 weeks out from the 2006 Mr Olympia. You will see how Ronnie’s daily routine has changed, and how the changes effect his body. You will see Ronnie departing to prejudging of the Olympia and right after he comes back from finals. This video is a must for all Bodybuilding fans, as Ronnie tried to make Bodybuilding history. Will he be back in 2007 to try again for title number 9? Filmed July 3rd, 4th, 5th, 6th 2006 on his final off-season week / 13 weeks out from the 2006 Mr Olympia. *** Ronnie’s bodyweight was an awesome 325 lbs. You will see Ronnie’s whole-body workout filmed over 4 days, including all 6 meals he consumes in the off season starting 10:30 am to 3 am. Next the DVD moves to September 11th, 2006 just 3 weeks out from the 2006 Mr Olympia. You will see how Ronnie’s daily routine has changed, you will see how the changes effect his body in his lead up till contest day. 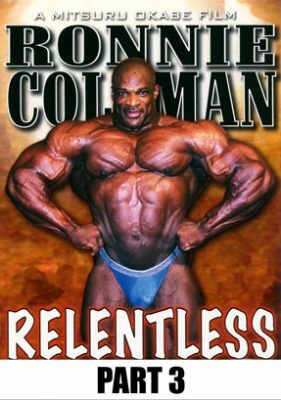 You will see Ronnie departing to pre-judging of the Olympia and right after he comes back from finals.This DVD is a must for all Bodybuilding fans, as Ronnie tried to make Bodybuilding history. Will he be back in 2007 to try again for title number 9?